I am just squeaking in with this entry. I really have to pay attention to dates more. Maybe I will learn that soon.. yeah.. right.. better luck next year! Super quick.. and this is also going to my entry for the contest at Nail Polish Canada. If you can spare a moment - you should go scope out the entrants and toss in a vote!! In my mind, this looked waaay cooler. 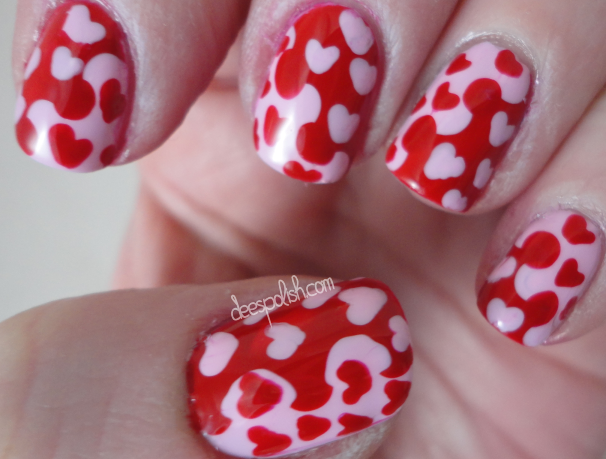 It was a heart-take on the interlocking dot mani. Kind of a bit of a fail.. but I think the idea would still work.. I just need to come up with a better way to execute it. I think I started to get it more at the end when I did my thumb.. but it is not quite perfect. Darn! Have a great day everyone - and see you soon!